Former Massachusetts Governor and 2012 Republican presidential candidate Mitt Romney is looking to take his outspoken objections to Donald Trump to the next level—by endorsing Libertarian candidate Gary Johnson for president. “I think he’s considering the possibility of doing this,” Johnson said in an interview with CNN’s Wolf Blitzer Thursday. “Actually endorsing the two of us,” he said, referring to his vice presidential nominee, Bill Weld. Romney’s opinion of Trump was made public very early on in the primary season when he gave a speech in Utah in March calling the Republican candidate a “phony,” a “fraud,” and was one of the first politicians to publicly question Trump’s business accomplishments including the controversial Trump University. Trump rebutted the accusations by giving a surreal press conference in Miami Florida which featured Trump products including steaks, wine, water, and magazines. Since then, Romney has been adamantly in the anti-Trump camp, even when it became clear that Trump had solidified the nomination. He campaigned with John Kasich in the lead-up to the Ohio primary and then voted for Ted Cruz in the Utah Primary. Last month, when asked about who he’s voting for, he said he would write in his wife’s name or vote for a third party candidate, which spurred on early rumors about an endorsement of Johnson. “And, at the same time, as I have expressed about Mr. Trump, I believe on the basis of temperament, and character that those are areas where I feel I simply can’t vote for him,” Romney said according to Business Insider. “I will either write in my wife’s name, who will be an ideal president, or I will write in the name of a third-party candidate,” he continued. 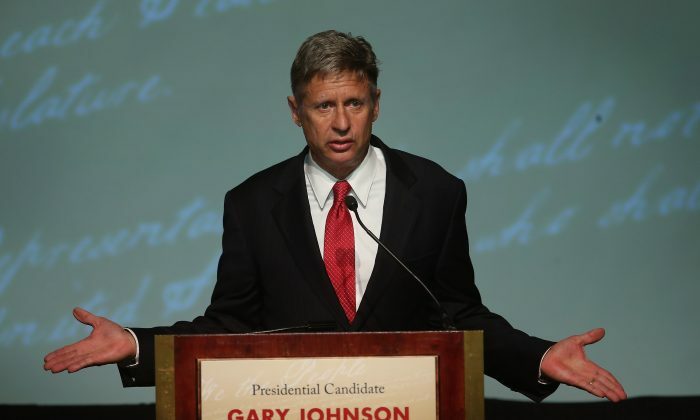 Libertarian candidate Gary Johnson and his running mate Bill Weld are making a pitch to conservative voters looking for an alternative to Donald Trump, with a small-government philosophy stressing personal liberties and freedoms. In recent polls, Johnson has been polling in the single-digits—averaging 8.6 percent when pitted in a three-way election with Trump and Clinton in a Real Clear Politics polling aggregation. A major endorsement from Romney would give more attention to the Libertarian party who, over the years, have struggled to get national attention. In the 2012 U.S. Presidential election, Johnson ran but received just less than 1 percent of the vote. If they reach 15 percent support then they will be make an important milestone—being included in the national debates. Johnson also said that the ticket was hoping to get the endorsement from Jeb Bush who has also said he’s neither voting for Trump nor Clinton.